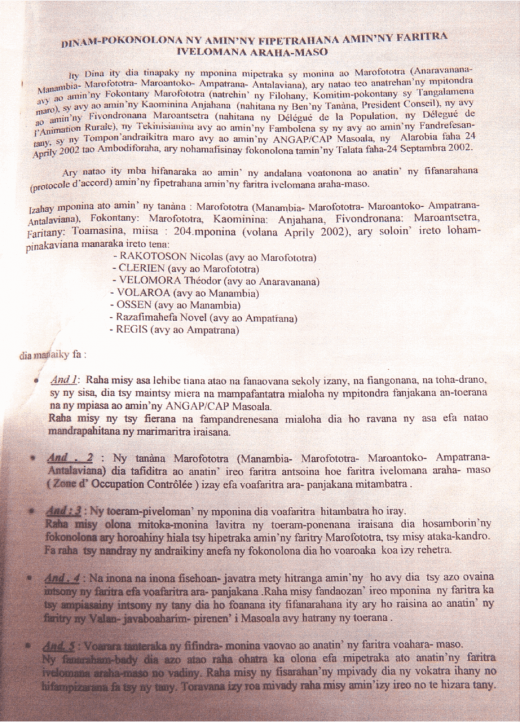 This Dina [contract] has been agreed upon by the inhabitants of Marofototra (Anaravanana, Manambia, Marofototra, Maroantoko, Ampatrana, Antalaviana), and it was concluded in front of the leaders of the Fokontany Marofototra (represented by Chef du Fokontany, the Fokontany committee and several elders), representatives of the Commune Rurale of Anjahana (notably the mayor and the Président Conseil) and of the District of Maroantsetra (notably the Délégué de la Population, the Délégué de l’Animation Rurale), the Techniciens of the Agricultural and of the Topographic Services, as well as several representatives of the Masoala National Park, on Wednesday 24 April 2002 in Ambodiforaha, and was confirmed by us, the Fokonolona on Tuesday 24 September 2002. It was done in accordance with the articles cited in the Protocole d’Accord regarding residence within the Zone of Controlled Occupation. Art. 1: Any large works to be undertaken such as the building of a school or a church or irrigation works etc. 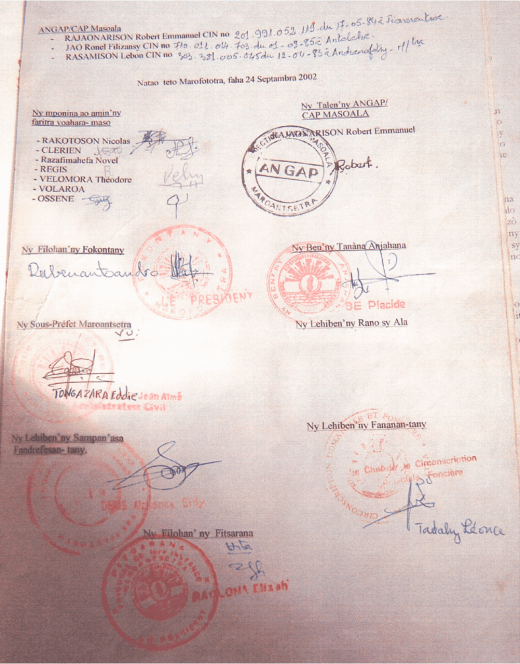 require the permission of the government representatives in the village or the agents of ANGAP/CAP Masoala. If no such permission is obtained, the work already undertaken will be destroyed and no further work may be untertaken until an agreement has been reached. Art. 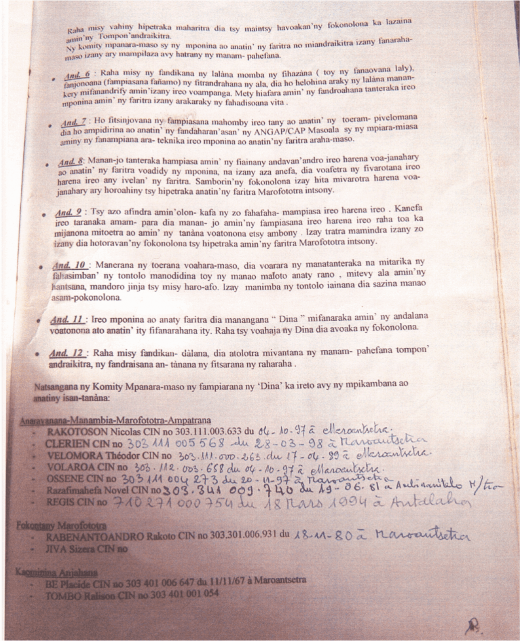 2: The village of Marofototra (Anaravanana, Manambia, Marofototra, Maroantoko, Ampatrana, Antalaviana) is part of those zones that are called “Zones of Controlled Occupation” which have been delimited by the government. Art. 3: All places of residence must be located so as to form a village. If there are people who live in hamlets away from the village, they shall, without any warning, be arrested by the population and will not be allowed to continue to stay in the zone of Marofototra. If the Fokonolona fails to fulfill this responsibility, the entire Fokonolona shall be expelled. Art. 4: No future events will change the limit of the zones which have been determined by the government. If inhabitants leave the zone and therefore no longer cultivate their land, this agreement will cease to apply and the land in question will immediately be included within the Masoala National Park. Art. 5: The immigration of new residents into the controlled zone is strictly forbidden, with the exception of a spouse of a person who is already a resident in the Zone of Controlled Occupation. If two spouses separate, only their material goods and agricultural products will be divided, but not their land. If one of them intends to divide the land, then both of them will be expelled. If there are visitors who intend to stay for a long time, they must be reported by the population to the responsible authorities. It is the responsibility of the Comité de Surveillance and the inhabitants of the zone to keep this under surveillance and to report any infractions to the authorities. Art. 6: Any infraction of the law concerning hunting (such as the construction of a lemur trap), fishing (the use of fañamo [the use of a particular plant which poisons the fish]) or the exploitation of the forest will be condemned by the corresponding law in force. This may lead to the permanent expulsion of all the inhabitants from the zone depending on the severity of the transgression. Art. 7: To ensure the sustainable [successful] utilisation of the land within the zone of occupation, technical assistance to be provided to the inhabitants of the Zone of Controlled Occupation will be determined within the programme of ANGAP/CAP Masoala and its partners. Art. 8: The inhabitants have the right to use for their everyday needs the natural resources inside the regulated zone, but they are not allowed to sell natural products outside the zone. Those who are seen selling natural products shall be arrested and expelled by the population and will not be allowed to continue to live in the zone of Marofototra. Art. 9: The right to use these resources may not be transferred onto any other person. Only the descendants of those who already live inside the zone have the right to use these resources if they decide to continue to live in the above mentioned village. Those who are caught having transferred this right shall be expelled by the population and will not be allowed to continue to live in the zone of Marofototra. Art. 10: Within the entire controlled zone, it is forbidden to effect or to initiate any degradation of the surroundings, such as defecating into the water, cutting down forest on a precipice, or burning forest for rice cultivation without creating a protection corridor. Those who damage the environment must do communal work as punishment. Art. 11: The inhabitants of the zone must establish a Dina which corresponds to the articles of this agreement [this sentence was probably taken from the Protocole d’Accord by mistake]. If the Dina is not respected, the population shall be expelled. Art. 12: Any infraction of the law will be handed over to, and judged by, the responsible authorities.